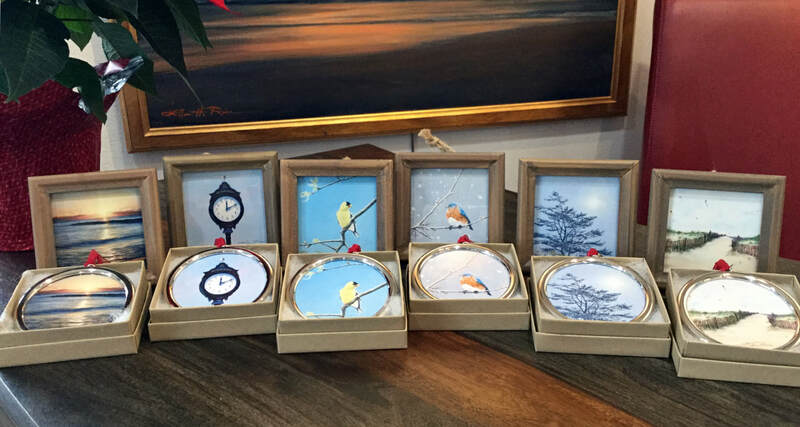 Ellen's sold out ornaments & mini frames are back! but they're back now, joined by another feathered friend ~ Ellen's goldfinch, Feathered Sunshine. Each $29.95 mini frame or ornament holds an archival gicle'e print on textured Somerset Velvet fine art paper that has been signed in gold or silver ink by Ellen, as well as titled, signed and dated in gold on the back of each. Ellen will be at her gallery this coming Saturday from 2 to 4 p.m. to personalize these popular new gift items and also any prints of her paintings you'd like to give to a loved one. Author and illustrator Joanne Guilfoil has left a handful of her wonderful new coloring and information books at the gallery for sale. Each is signed by the artist/author and you're invited to come pick up a first edition copy. A great stocking stuffer idea! Collectors of Ellen's work might recognize the cover painting, Morning Reflection. Ellen will be happy to sign your cover as well. Be sure to take advantage of the fact that there is an expert Disney and Orlando travel advisor on staff at the Ellen Rice Gallery and he will be happy to help you plan the most magical Disney or Universal Studios vacation imaginable for your family. Duane has been planning Disney travels for more than 30 years and specializes in multi-generation travels to Walt Disney World, on the soon to be seven ships of the Disney Cruise Line, with Adventures by Disney and the rest of Disney's many resorts around the world. You can call him for an appointment or stop in during regular gallery hours. Do call ahead to check his hours. My eNewsletters usually go out once a month or less, but in a busy season may go out every couple of weeks. I never sell or give my eNewsletter mailing list to anyone ever, so your email address is completely secure. Below are a few sample newsletters. Celebrating in Ocean View ~ Join us!